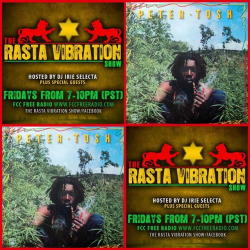 Rasta Vibration Show – Radio for the People, by the People. Reggae show hosted by DJ Irie Selecta playing all types of reggae from Dancehall, Lover’s rock, Ska, Rocksteady, Roots…With special guests, Ticket give a ways and live interviews with some of your favorite reggae artists!!!! 15 Responses to "Rasta Vibration Show"
Big up James! Thanks, Glad we are able to help you through your day. Yo, show is tight. Been talkin to Bruce and he says what’s up. love the sound my friend keep it up. Blessed love Irie Selecta Give thanks for the love my friend. Just got back from Reggae in the Hills. So much love! Didn’t want to come home! The best reggae show over the airways today! Maximum respect to the Irie Selecta for holding it down all of these years!